The Reichshof Hamburg, Curio Collection by Hilton, is a historic landmark dating back to 1910. Its creator, Anton-Emil Langer, made a fortune in international shipping, which he used to finance his dream: building a technologically advanced hotel in the center of Hamburg. Indeed, it was the largest and most advanced hotel of its time in Germany. The building’s outer appearance displays Reformation-style architecture, while its interior exudes the special charm of the early 1900s with columns made from Italian marble, elaborate wood paneling, and shimmering copper elements. The most recent refurbishment was finished July 17, 2015, when it re-opened under the new name, Reichshof Hamburg, Curio Collection by Hilton. The Reichshof Hamburg, Curio Collection by Hilton offers 278 room, decorated in the distinctive Art-Deco style. These comfortable accommodations have features typical of historic buildings, while offering modern luxury and style in elegant forms with charming individuality. 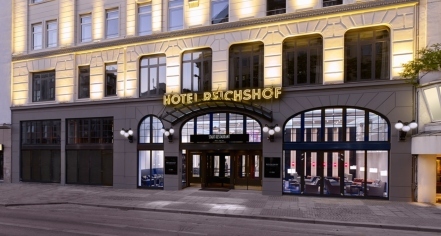 Amenities provided by the Reichshof include cable, a plasma television, daily housekeeping, blackout curtains, free WiFi, a Tassimo hot beverage machine, and luxury toiletries. Guests looking to dine at Reichshof Hamburg will be pleased to find three sophisticated establishments at the hotel: The elegant Stadt Restaurant with its beautiful wood paneling and luxury liner aesthetic; the chic and cozy Bar 1910; and, the vibrant Emil's Café, Bistro and Bar. Nestled in the heart of the trendy St. Georg neighborhood, the Reichshof Hamburg, Curio Collection by Hilton is the perfect starting point to experience the best of Hamburg. Just a short walk from the City Centre, Alster Lake, and shopping promenades like the Jungfernstieg, guests can enjoy a performance at the Elbphilharmonie concert hall, visit the city’s UNESCO-recognized Speicherstadt warehouse district, or stroll through beautiful city park of Planten & Blomen. 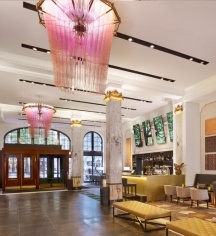 Reichshof Hamburg, Curio Collection by Hilton, a member of Historic Hotels Worldwide since 2018, dates back to 1910. Founder Anton Emil Langer’s descendants still live on the family estate, on the River Elbe, just eight minutes from Reichshof Hamburg, Curio Collection by Hilton. Cribs and Pack-in-Plays: Available upon request for 15€. Deposit: There is a deposit required of 50€ per stay. Early Check-In/Late Check-Out: Check in before 11:00 a.m. is 30€. Check out is free upon request until 5 pm, which incurs a 30€ fee followed by the daily rate. Hotel/Resort Fees & Taxes: A city tax is imposed by the city of Hamburg. Please contact hotel for details. Parking: Self-parking is available for up to 15€ per day. Payment: All forms of payment are accepted. Payment is required at time of booking. Maestro, Mastercard, Visa, American Express are accepted. Pet Policy: 15€ per night for small dogs up to 15 kilos. Rollaways: Available upon request; 30€ per night. The Reichshof Hamburg, Curio Collection by Hilton, is a historic landmark dating back to 1910. Its creator, Anton-Emil Langer, made a fortune in international shipping, which he used to finance his dream: building a technologically advanced hotel in the center of Hamburg. Learn more about the History of Reichshof Hamburg, Curio Collection by Hilton .